Every now and then I let you see a glimpse into one of my specialist subjects. Well, as it’s Easter weekend, and I’ve been finishing off a piece of genealogical research for a client, I thought I’d share a post from my genealogical website (caithnessroots.co.uk). This wasn’t research carried out for a client, the work for my clients is confidential, but done for fun using one of my collection of old photographs. This article shows just how interesting a photograph with a name can prove to be, if you are lucky enough to come across one. I have in my possession a number of photos taken from the same old Scottish album. 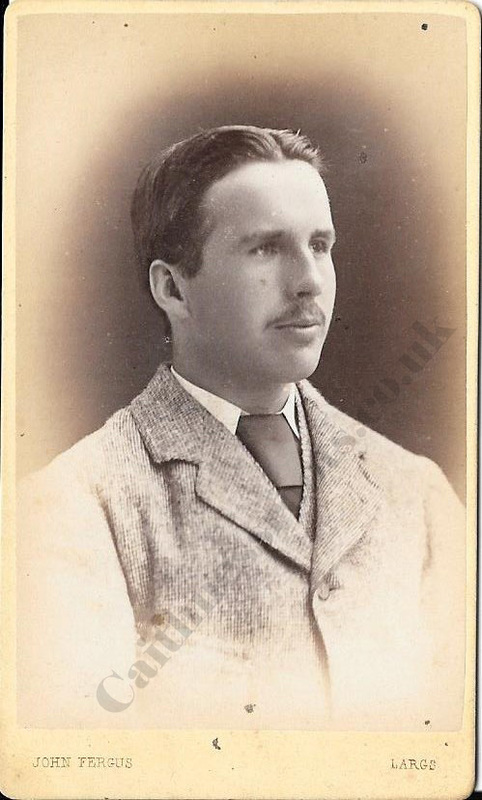 Most of the photographs seem to be from around the 1870s to 1890s, and there is one of a rather lovely looking chap. His name was Watson Dickie and he died at the tender age of 19 in Stratford on Avon, in March 1878. Watson Dickie, an amiable and promising young man expired yesterday (Friday) at noon, after a brief illness of only six days. He was at Chapel on Sunday morning, and complained of a substance being in this throat. Mr Nason, the family surgeon, ordered him to bed, as he was suffering from Diptheria. He never left his bed again. The young man was of a most obliging and courteous disposition, qualifications by which he gained many friends, and large numbers will hear the sad news with regret, as he took part in all the athletic ports prevalent in the town. A week later the newspaper related his funeral information, the service being held at the Baptist Chapel, with Mr Dickie’s body being enveloped in a plain oak coffin. It mentioned that he was on the staff at the Old Bank, and family members and friends were noted, among those being WH Dickie of Edinburgh and Mr Thomas Watson of Glasgow, his uncles. In July an article showed that his friends had raised, by subscription, a beautiful memorial for his grave. Watson’s father John Tod (or Todd) died, according to the same newspaper, on the 2nd January 1880, aged only 51. By following his family in the census I was able to recreate a very detailed family tree, too large to note in such as short article, however Watson appears to have been the second son in a family of twelve children. He was baptised in Renfrew in 1858 to John Tod Dickie and Catherine Watson. 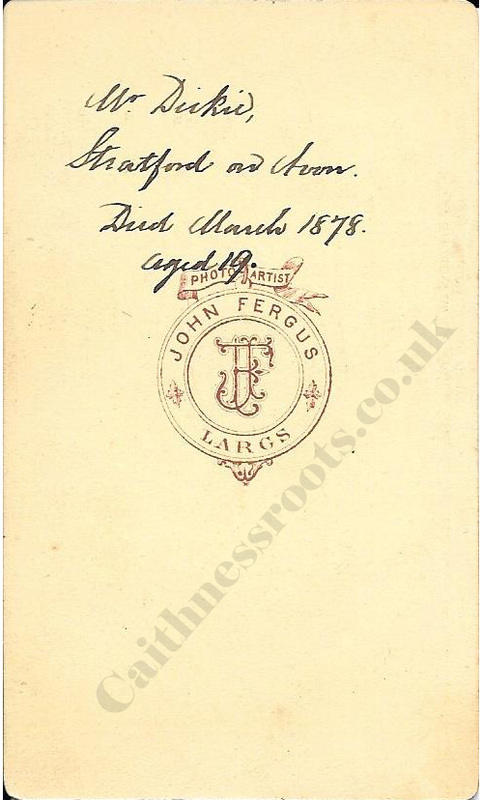 At the time of Watson’s death his father was a partner in Flower & Son’s brewery in Stratford, but at the time of his son’s birth John Tod was a corn factor. His fairly mundane sounding job description belies his rather illustrious background, for JT Dickie was from a very interesting family. Dickie, John Tod, corn and flour factor, agent for the Caledonian Fire and Life Insurance Co., 30 Hope street; house, 173 St. George’s road. John Tod Dickie, was actually working in the family firm. The Caledonian Insurance Company began life in 1805 at 7 Hunter Square, Edinburgh, with Mr William Braidwood as Manager and Mr. William Dickie as Secretary. Dickie continued as Secretary until his death in 1812, and in the same year was succeeded by his son Henry David Dickie, who went on to become the second manager of the company in 1830. He was John Tod’s father and Watson’s grandfather. The Caledonian Insurance Company is one of the oldest insurance companies in Scotland, and is now part of the Royal London Group. Henry David Dickie (Watson’s grandfather) died in 1863, leaving four unmarried daughters and his son also named Henry David, to fend for themselves. Henry seems to have taken it upon himself to become the head of the household, as a Member of the Edinburgh Stock Exchange he must have felt in the position to do so. However, things turned bleak for Henry. Thirty years later in 1893, at the age of 68 and still living with his sisters, he was declared bankrupt, and in 1894 he was charged with embezzlement of £1000. He failed to turn up at court on 6th October, and again on the 22nd October, after which he was declared an outlaw. He was noted as a bankrupt again in 1896 and he turns up in 1901 in Hampstead, London with three of his sisters, the older of whom was now a widow and head of the household. He died in 1906. Watson Dickie’s brother, also named Henry David Dickie moved to Birkenhead, Liverpool. He was living there by 1891, with his sister Emily, as an East Indian Produce Merchant. He must have been living a comfortable middle-class life, having a cook and a housemaid in his service. However he appeared in local newspapers in 1916 after a ‘Chinaman’ turned lunatic in his house. The Liverpool Echo of Sept 1916 noted how Dickie’s two domestic servants were alone in the house at night when a ‘Chinaman named Li Gun’, subsequently charged as a ‘lunatic wondering at large’ broke into the house and stole a pair of dumbbells and three earthernware dishes. The women had just gone to bed at the top of the house, around 11pm, when a noise alerted them to the intruder, who knocked at their door and tried to get into their room. The intruder then proceeded to ransack an adjoining room and fall asleep on the bed, until around 5am when he again tried to burst into their room. In fright they ran to the window with the intention of jumping out, but then saw the man slide down the roof towards them. The housemaid bolted from the room and ran across the road to a Mr. Stewarts house. Stewart telephoned for the police then ran across the road and caught the prisoner. The Chinaman was a seaman on board the S.S. Cyclops, joining the ship in Hong Kong, and after being declared of unsound mind was remanded to the workhouse for seven days under observation. Glad you like it Joanne…sometimes the photos are really difficult to research though. One other thing (well two really) that I found out were that JT seems to have been on the Shakespeare Tercentenary committee…at least he was one who people had to go to to get tickets…and his will is housed with the Shakespeare Birthplace Trust. Hi took part in geneaolgy since 1992 and just found out William Dickie was my 6th Gt Grandfather ( I think ) through my Grandmothers side.